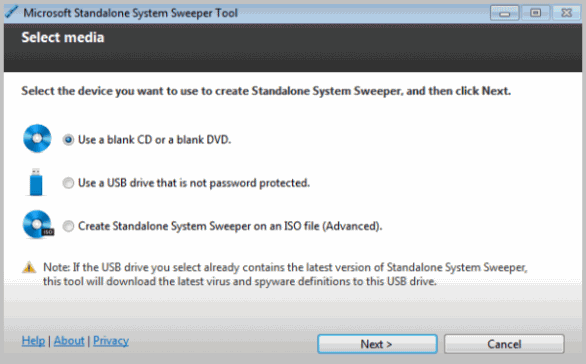 Microsoft recently released a rather interesting beta the other day, called: Microsoft Standalone System Sweeper Tool. This is a tool designed to rescue and fix computers that cannot boot into windows. These days, many viruses, malware and what not target the boot sector of your hard drive, rendering the computer unbootable. And in many cases also unfixable to the windows Startup Repair Tool found on the Setup disk. This new tool is NOT a new antivirus or malware detector, but a tool to use once the problem is a fact. So naturally I would advice you to download it now, and keep it on a flash drive, or a CD. The only problem I foresee is to remember where that CD was put or on which usb pen you stored it. In addition to help solve boot problems, Microsoft also promise that this new tool can be used to solve problems regarding your current anti-virus program whether it cannot be installed or that windows cannot detect it. The Microsoft Standalone System Sweeper Tool first scans your boot sector for any corrupted files or settings. It then scans your system for any known malware or infections. Microsoft Standalone System Sweeper Tool comes in both flavours (32 and 64 bit) and supports XP (SP3), Vista and 7. This useful tool is a part of MSDaRT. I used the 64 bit and it found bad dude. I can not get the 32 bit to work on my other machines. They are win xp pro. Has someone had this problem?